Pete Dunn has announced his retirement effective immediately. Long-time Stetson head coach Pete Dunn had announced this past spring that he would retire following the 2017 baseball season. However, he had a change of heart and announced Monday that he’d be retiring, effectively immediately. Dunn’s sudden decision comes as a surprise to some, but also of advantage to the Hatters, who now don’t have to wait until next summer to potentially go head-to-head with some bigger schools on the coaching carousel. “This is the right time for me to hand the program over to someone else, both personally and for the program moving forward,” Dunn said. “I have given my life to Stetson University, and the Stetson Baseball program, for 40 years. I still carry my love for the game, but it is time for me to move on. Dunn will leave a lasting legacy on the Hatters program. In his 37 seasons with the Hatters, he captured six Atlantic Sun Coach of the Year honors, while also guiding the team to 17 NCAA postseason appearances and three conference regular season titles. Overall, Dunn finishes his coaching career with some impressive accomplishments. His record sits at 1,312-888-3, which ranks 15th in NCAA Division I history. While Dunn’s coaching career is over, he now transitions to a new role of Head Coach Emeritus, where he will focus his efforts on fundraising and other areas that could impact the baseball program. 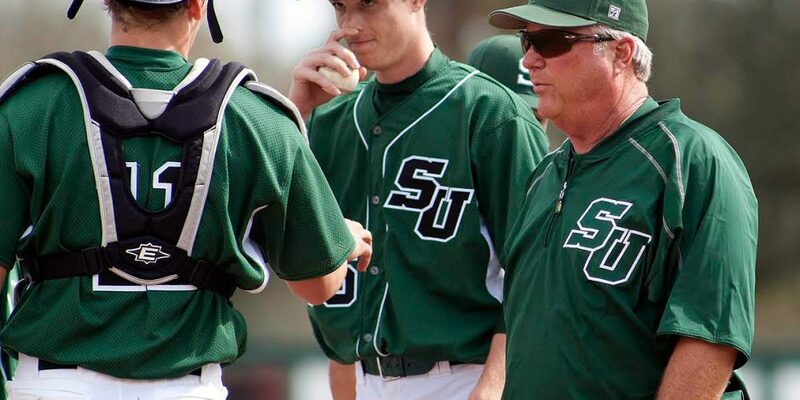 “As someone who played for Coach Dunn, coached with him and, for the last 20 years served as Director of Athletics, I can tell you that no one is more passionate about seeing Stetson Baseball succeed than Pete is,” Athletics Director Jeff Altier said. “I am so pleased that he is able to walk away at a time when the program is still basking in the success of last spring’s run to the ASUN Championship and trip to the Coral Gables Regional. “There is a very solid foundation in place here to return to that championship level year-after-year. That is a credit to what Coach Dunn has built over the last 37 years as head coach. The Hatters announced Friday afternoon that a press conference to name the new head coach would be at 10 a.m., on Monday, December 19, and all indications from sources suggest it will be Maine head coach Steve Trimper. Trimper has spent the past 11 seasons with the Black Bears, where he guided the program to a pair of NCAA postseason appearances. Interestingly enough, Trimper’s move to Stetson comes on the heels of a three-year contract extension he signed back in mid-April. Trimper’s three-year extension would’ve paid him an annual salary of $86,995 beginning on July 1, 2016 and running through June 30, 2019. Florida State’s Mike Bell and Twins High-A manager Jeff Smith also were heavily considered. Bell, though, dropped out of consideration on Thursday, and Smith, sources suggest, is due for a promotion within the Twins organization. Stay tuned to D1Baseball.com for more on Stetson’s process to find Dunn’s replacement.